Have you ever wondered what happens to luggage that doesn't quite make it back to its owners? 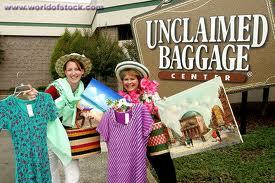 Unclaimed Baggage Center in Scottsboro, Alabama is a treasure trove of the sublime as well as the ridiculous. If you go on their site, under press, you'll find the stuff that dreams (and nightmares) are made of.... that others have left behind, or lost. I'm thinking of heading to Alabama after my upcoming trip to Atlanta. I could use a couple of ballgowns. I'll just leave the food finds alone. Ugghh. Recently made a trip there the last time I was in Atlanta. Cool idea, but it reminds me of a TJ MAx or Marshall's. 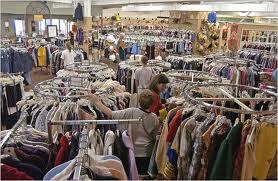 It was so incredibly crowded and for most things to actually be second hand, I found them a bit expensive. The sweet spot, however were the electronics. Lots of good deals to be had. If you make the drive from Atlanta, be sure to take the back roads and stop in a town called Mentone, Alabama. There are these really old log cabins that were moved from their original location and now house cute little restaurants and shops. Is this on the way from Atlanta to Charleston? What route would you suggest?